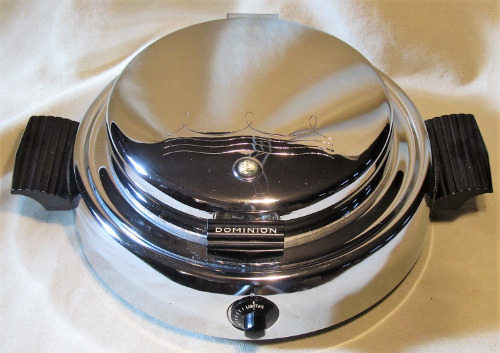 This waffle iron was made in the the 40s by Dominion Electric in Mansfield Ohio. It was manufactured until 1942 then the war got in the way and was not made again until 1946. It was popular and sold into the 1950's. This unit has a thermostat that controls very well, from 330 F to 446 F. A glow prism on the top and some waves etched hearkening back to their early days. Comes with new cord set. Completely re-built, re-wired and new connectors. This one will come to you in its original box!